Liquor offers available from 17/04/19 until 23/04/19 or while stocks last. 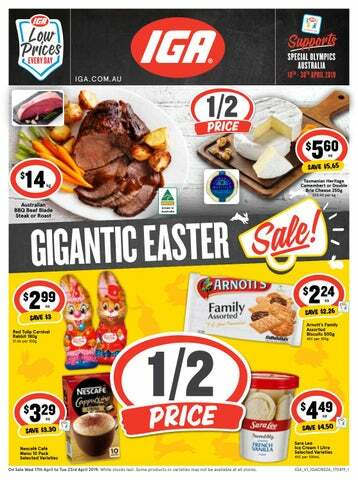 Specials available in NSW & ACT IGA Liquor outlets only. Regional pricing may vary. IGA Liquor supports the responsible service of alcohol in accordance with the Liquor Act 2007 (NSW) and legislation to reduce smoking rates including the Tobacco Advertising Prohibition Act 1992 (Cth) and the Public Health (Tobacco) Act 2008 (NSW). It is against the law to sell, supply or obtain to supply to a person under the age of 18 years old. Quitting smoking will improve your health. Call Quitline 13 78 48, talk to your doctor or pharmacist or visit www.quitnow.gov.au. We reserve the right to correct printing errors. 100% Australian and independently owned.